In the rooms where the engravers work their drawings into the steel of a shotgun’s receiver, the meditative strike of their hammers on the heads of their chisels makes a tick-tick-tick-Tick-TICK that you might first think was coming from a woodpecker’s drilling on a tree. The tones are woodsy, with intensity and punctuation. An engraver sketches the line that he or she will then follow into the steel, so the sound of the hammer hitting the chisel rises in timbre and rhythm as the point of the chisel finds its line, travels it, and the hammer blows intensify toward the end of that phrase. Twelve engravers are at work as Beretta’s master engraver, Luca Casari, and I stroll through the factory’s second-floor engraving loft in the Italian Alps, so that this soft percussive sound track comes from all corners of the room, a staccato, lapping, ongoing chorus, like the fleet play of fingers on a piano during a fugue. What’s especially musical about all this is the process: It’s the sound of a pair of hands—the sound of a human—infusing a two-inch-by-three-inch-by-three-inch piece of steel with literally thousands of little cuts and twirls that tell a story, be it in the feathering of a setter’s leg, or in the heart-stopping leap that a pheasant makes as it takes flight. It’s an old art, in an old family factory, in an even older place that is mainly a mining culture. It’s as if everybody here is descended from Vulcan—molten ores and alloys are in their blood. Luca Casari at work on a shotgun. The valley is the Valle Trompia, green and steep in the mountains, hard by Lake Garda, fed by the rushing Mella River. Lake Garda is the eastern Alpine lake north of Verona, home of the great Alto Adige white wines, and the home, for five hundred years, of the oldest arms manufacturer in the world. The Beretta fabbrica—formally, the Fabbrica d’Armi Pietro Beretta—is literally strung out along the river for thousands of yards. At one point the river actually runs through it, just a few dozen feet from a chunk of the factory floor. This is an apt siting for any factory, but it is especially apt for Beretta. It’s on white-water flumes like this in the steep valley that the aboriginal Alpine tribes—Celts, Teutons, Ostrogoths, Lombards, and in the case of the Valle Trompia, the namesake Trumpilini—noticed the iron in the color of the rock, and knew that they could smelt it for weapons. They did that well, and they knew how to use them, which is why the apparently fierce Trumpilini are listed first among the opponents on the circa 25 B.C. triumphal monument to Augustus near La Turbie. Americans can be forgiven for thinking that Browning, Colt, and Smith & Wesson have grand histories—which they do, on an American scale. But let’s pause to absorb the scale of this narrative: Arms have been made in the Valle Trompia for more than two thousand years, as Augustus and his centurions discovered when they tried to take the valley for Rome. For one-fourth of those two millennia—since the Arsenal of Venice commissioned 185 harquebus barrels in 1526 from Bartolomeo Beretta, whose receipt is still in the Venetian archives—the Beretta family has been making guns here. They know how to do it. Today the valley remains a mecca for bespoke gun clients from around the world. There are a dozen other, smaller gun fabbriche in the Valle Trompia (two of which, Benelli and Franchi, Beretta has bought), as well as some thirty custom engraving ateliers. Luca Casari—studied, philosophical, gently spoken—is the professor sitting at the fount of all this talent, coaxing, instructing, adjudicating the ancient craft. Most of the students come from the local arts lyceum, those interested in the graphic arts. This dozen have finished their master work and are staying. One young woman—in what seems something of a contrast, a sweater and jeans, before such a rigorous, formal beauty—is working on a receiver with some partridge rising before a gun. It’s exceptional work; it’s hard to believe that it is cut, rather than somehow magically poured over the gun. In fact, that’s the point of engraving, and the medieval tools used to do it. A Beretta SO Sparviere, with more than six hundred hours’ worth of engraving. It’s significant—and squarely in the tradition of a medieval atelier—that the Beretta students begin their study by manufacturing their own tools, meaning, the engraver’s holy triumvirate of the hammer, the chisel, and the bulino, or burin, which is the ancient beveled hand chisel with a round grip whose flattened head fits precisely into the palm of the engraver’s hand. With its deep-V beveled blade, the bulino is used for the very fine creation of shadow—the underside of a bird’s wing, the shade of a tree—which is a basic element of any narrative of movement. The more Renaissance, ornamental bas-relief scrollwork is created with the hammer and chisel. “Would you like to try it?” says Casari gently. “Let me demonstrate.” He smiles. Casari has been planning on this; my own personal naked block of steel—a piece of scrap, I very much hope—has been set up in the vise at the bench. Casari addresses the workbench with all the balletic formality of his profession, feet apart shoulder width, elbows raised. The chisel rests lightly in his left hand and the hammer in his right. He pauses for a nanosecond in front of the steel, a moment of contemplation. He looks like a dancer about to leap in a grand jeté across the stage. Instead: four quick elegant taps, and the steel divides precisely along the line, curling like butter under a knife. A burin and a set of chisels. He hands the tools to me. I bump the chisel out of the line at first. It’s steel, and its hold on our imaginations is that it’s a hard substance, but with tools this sharp, steel is malleable, almost liquid. My success, or better put, my avoidance of utter failure in keeping the chisel moving lies in a very measured tempo of hammer blows, and a nearly (for me, anyway) flat application of the chisel. I’m not thinking about drawing, much less “beauty” or anything like it. I’m not capable of infusing my hands with any such complex desires. I’m barely able to follow the straight line. “Not too bad,” says the ever-gracious Casari. In fact, it was an abominable performance. He hands me the bulino. The bulino is a very different thing. It feels like nothing, which is terrifying in a completely new way. Holding a hammer, you feel like something, right or wrong, might actually transpire, but the bulino is so inconsequential as a thing that you feel quite naked in front of a block of steel. Where, you wonder, is the cutting, graceful tool-ness going to come from? Me? Where are the buttons on this thing? Does it have a buzzer to tell you when you’ve gone too far? And that is the bulino’s medieval demand: You, the person at the bench with the bulino, must become the artist. With no intercession from any other tool, it is your muscles that drive every little twist and turn of the bulino’s amazing blade. Again I make the rookie mistake of confusing force for process, and after approximately a centimeter of trying to follow my line, the nose of my razor-sharp bevel has dug so deep into the steel that I’m stuck in the mud. The thing won’t move no matter how hard I press it. With a lot of what I will call wrist yoga and a lot of concentration, I manage to send up a reasonably fine curlicue of steel out of a reasonably straight line. The notion of, say, shading the underside of a pheasant in flight on the side of a receiver is unimaginable for me. “Another four years and three hundred sixty-four days of practice, and I ought to be fine,” I tell Casari grimly. “The third technique is the gold inlay,” Casari says, taking the chisel and cutting two parallel deep short lines, then picking up a roll of thin gold wire and beating it into each line with his hammer. It’s a completely different sound, the soft clang of the hammer directly on the metal, almost an E sharp. The Beretta gun museum showcases the company's history. “A dovetail cut,” he explains, “which, if it’s done properly, really sticks the gold in.” Then Casari takes the back of his hammer and burnishes it quickly, two perfectly parallel bright yellow scars on the ice-blue ground of steel. A dovetail cut means that the fat part of the dovetail shape is at the bottom of the cut. All we actually see of the gold is the skinny top part. What Casari does as he taps and burnishes the gold into the cuts means that he’s forcing the gold into the dovetail’s trapezoidal sides—the walls of the cut are angled toward each other. We can look at the process in two ways. In one view, the fingers of gold reach into, and under, the steel. Seen from the perspective of the steel, it’s the steel that holds the gold in a vise grip. The whole thing is an ancient, ingenious bit of joinery, which is why everything from First Dynasty Egyptian furniture to the drawers of eighteenth-century English dressers are joined with dovetails. The lines are about a half-inch long. On this infinitesimal scale, in this master’s hands, the painterly, narrative reach that two lines of gold could bring to the side of a gun becomes clear: a fence rail, a lane, two banks of a river leading to the sea. It’s easy to think of a fine double as a hard thing, built to carry the rigors of the field with accuracy and reliability, two qualities that are quite difficult to achieve in its manufacture. The great fine guns are that, in part. But a shotgun is also made to be fluid, to move with supreme agility, and to cast its grand spray out to a bird on the wing. As a gun is born in the hands of its makers, they must consider all of these things, plus the ferocious demands of constant internal combustion. In the creation of Ferrari or Lamborghini racing and sporting cars—what we might call the other famously well-engineered internal-combustion products of northern Italy—there’s a whiff of forgiveness in the scale on which the engineers work as they create and channel a car’s energy. If they can’t run power or fuel lines one way, they can run them on the other side of the well. Turin’s engineers might disagree, but there’s far less tolerance in the design of a shotgun than in that of a sports car: The space is supremely tight, and there’s no other way to arrange barrels, chamber, or receiver. It means that, even to be able to innovate, a shotgun’s designers and engineers must act as watchmakers, more or less. And then there’s the other problem: It’s even more difficult if you want to make the thing beautiful. “We must explain a bit of history, because it’s the history that explains the future somehow,” says the expansive, impeccably blazered Franco Gussalli Beretta, laughing. We’re sitting in the showroom for the Beretta fashion line, in the family mansion. In 1925, Pietro Beretta, Franco’s great-grandfather and the then–family member on point at the company, built this fairy-tale stone villa in the Tuscan style on the factory grounds. Franco Gussalli Beretta on the factory grounds. The brick four-story building, with its grand country-Italian eaves, presides over the village of Gardone in front of the fabbrica, exuberant window boxes filled with bright plantings at every arched, seven-foot-tall window. The family uses it now for meetings and conferences. But at the time it was built, the villa was the ultimate in architectural statements. It’s not situated on some estate out from town, in some other place; rather, the villa states unequivocally that the Berettas, as a family and as an industrial presence, belong to Gardone and the Valle Trompia. They are here. They make beautiful things that came from the iron in the valley. They’ve never been anywhere else, doing any other thing. In 1985, Gussalli Beretta’s father, Ugo, president of the company, sealed the deal with the U.S. Army to supply its sidearms—specifically the Beretta M-9. That contract, just renewed last year, caused Beretta to build an entire fabbrica in Accokeek, Maryland, exclusively devoted to the U.S. police and military trade. After university and military service, when Gussalli Beretta was twenty-five, he went “down,” as he puts it, to the factory. His great-uncle Giuseppe suggested that he spend time in the premium-gun area. In addition to the fact that the premium-gun craftsmen of his generation were aging out, there was a severe market slump in the luxury gun market in the late 1970s and early 1980s. At Beretta, the tradition is to “hammer” the barrels on a lathe, which results in what’s called a monoblock. Though supremely strong, the monoblock results in a seam, or weld, between the barrels and the chambers. Just off the showroom and consultation rooms where clients can order guns sits the section of the fabbrica where the SO 10s are built, a large high room of about five thousand square feet, walled off with glass. There is no special hush here; it is still very much a part of the fabbrica. The barrels and the receivers are milled in another part of the factory, but this is where the company keeps raw blanks of Turkish walnut for the stocks and forends and where the guns are physically made. The main work in this section of the factory is the assembly—the stocking, and the fitting of the receivers and barrels to the stock. Depending on a client’s wishes for the stock and the engraving specifications, a commission for an SO 10 can run to a hundred grand. Ferdinando Belleri is Beretta’s master craftsman—he has just celebrated his fortieth year with the firm—who runs the luxury gun program. This room is his realm. Deliberate, slim, athletic, with tight salt-and-pepper hair, Belleri looks as if he’s ready to chew a couple of chocolate bars and climb an Alpine massif at the valley head with a rucksack and a rifle strapped to his back to bag a mountain goat. But Belleri’s hands are the most impressive thing about him: worked, muscular, broad, and at the same time very fine. He came, he says, to the factory as a teenager. Now the company sends him to meet with premium gun clients around Europe and the world. There are banks of assembly and engraving stations along the walls and down the center of the room. Here, wrapped individually in oil rags, is a table of receivers; there are a few barrels being worked. Nothing is rushed. There’s a sense of time in the room; there are no bins of parts waiting to be drilled on a lathe or staged on an assembly line—an assembly line would be an anathema here. The craftsmen move quietly between stations. The deeper examination of any element of a premium gun’s architecture reveals the painstaking decisions and revisions of decisions the makers confront. Belleri leads the way to the walnut room, a sealed glass enclosure of perhaps three hundred square feet on one side of the floor. In it, blank stocks are kept on racks under moisture—as in a steam room minus the heat—so that the wood will stay, in his words, “lively,” meaning, so that the blanks won’t dry out and warp. The company’s patented sidelock system. “For years we used European walnut, but lately we’ve found that the Turkish walnut is the best, with the density of the grain,” he says, taking a small hand spray, misting some water onto the side of a blank and rubbing it with his thumb. The dense whorls of walnut grain pop out under the sheen of the water—there is so much rich, dark, curling depth at play in this piece of walnut that it is as if Belleri has lifted some magic window that allows us to see the wood itself, reflecting the story of the world and the weather over the two hundred years that the tree grew. In his forty years, Belleri has seen a lot of walnut that wouldn’t work, and a lot of engraving, and a lot of metal worked well and worked badly. It’s this long experience of wading through the world of materials that gives his particular search for perfection a note of grace. The very best craftspeople of the company are now, after forty years at his work, in his care. I ask him what makes a good gun maker. “There are many qualities, but artistry, first, and some extra portion of patience,” he says. “Hard to describe. Perhaps it’s easier to say it is the desire for excellence,” and then he pauses, thinking about it another way. “You know, there are many people who work here for thirty years and who would never be accepted to work in this room,” he says. The panoply of artistry at Beretta over the centuries is most visible in the gun room, the company’s private museum. It’s in an older part of the factory, and in fact was the nineteenth-century “store” or factory showroom, the perfectly preserved public face of the fabbrica where clients could visit, be fitted with try-guns, and order weapons. With its creaky pine floors and its altar-like Victorian Gothic gun cabinets running for thirty yards down each wall, the room resembles nothing so much as a church of firearms. Midway down on the cabinets on the left-side wall hangs a copy of the Arsenal of Venice’s original order for the 185 harquebus barrels from Bartolomeo Beretta. Records of sales from 1882. Although the room now houses the collections, one should regard the room and the guns as separate things. The interior architecture holds the firm’s mercantile history; the cabinets hold the manufacturing history. The room is an absolutely untouched nineteenth-century place of business. It’s just Antonelli and me kicking around in here looking at beautiful guns, but I have the strong sense that just behind us hover the ghosts of many a mustachioed clerk in vest, shirtfront, and collar, garters on their sleeves, waiting for the signal from the more formally suited salesmen to fetch our bespoke 12-gauge side-by-sides. But what’s in the cabinets these days differs a bit from what was on sale in 1896. The hall has great ranks of twelve-foot-high gun cabinets that run its length—one down each long side, and a sort of series of “island” cabinets that run down the center. It’s mainly, but not entirely, chronological. The more modern history is on display on the north wall: World War I–to-the-present military and police models, machine guns, automatic pistols, including rare World War II machine guns and sidearms. 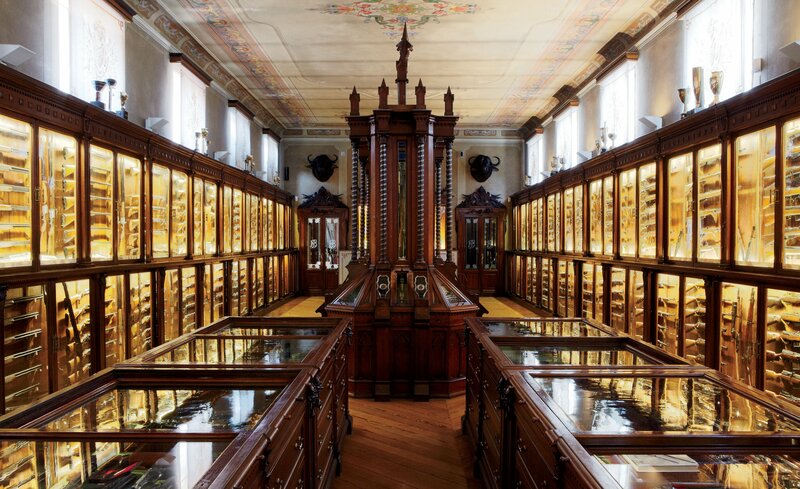 The south wall of cabinets contains the gorgeous early guns, from 1600 to 1900, approximately, running from flintlocks through percussion caps, early rifles, and then some few hammerless models. What’s clear from the cabinets is that there was always a market for luxury guns. The trick and the success for the Berettas was, they had to make them fine enough and strong enough for people to want to pay for them. The central rank of cabinets contains long guns, as well as drawer after drawer of pistols, in addition to fabulous anomalies not manufactured by Beretta. cap muskets. Then he says, “Come this way,” and takes me to the end of the hall, where there is a small half-glass door. It is an office suite, if you will, with some surprising treasures in its glass-fronted cases—eighteenth-century samurai swords—and a few guns, along with a collection of Japanese sword guards. Around the corner from the cases sits the imposing original partners desk of Carlo and Pier Giuseppe Beretta: the face-to-face double desk of the men who brought the company well into the twentieth century, and who handed it off to Ugo, Pietro, and Franco Gussalli Beretta, the men running the company today. Portraits of older Berettas and pictures of the factory, along with an award from the last Italian king, Vittorio Emanuele III, adorn the walls. It is an older Italy in here, as well as an older company. And there is a key to the company’s survival for half a millennium. Behind the partners desk is a wall of old file books more or less stuck into and over an old fireplace. Antonelli and I nose around in it and pull a few books down to thumb through them. The records are rather modern-era in Beretta terms, from the 1920s, each transaction immaculately and rather sweetly recorded in ink. Due fusilli…two long guns…going to…Verona, reads one order. It’s just one of thousands. The books are a monument to the mountainous persistence—the iron will, pun intended—that has kept this firm making guns for so long. They are why the earliest gun in the collection, a mid-1500s wheel lock pistol signed on the barrel by Bartolomeo Beretta, is so significant. Like the 185 harquebus barrels the Arsenal of Venice commissioned, that delicately engraved sidearm means that the firm had been operating and capable of high mechanical development since the late 1400s, at least. The cozy, manly old office feels as if the late-nineteenth-century gun makers had just gotten up from their partners desk, taken their hats and canes, and gone out front for a cigar. Sitting as we are in their very chairs in the Valle Trompia, I have the sense that they would be back from their cigars right swiftly, and that Antonelli and I had better be well cleared out of here by then.